GottaCon is a three-day broad spectrum gaming convention that is held annually on the first weekend of February in Victoria, British Columbia. GottaCon celebrates the science fiction and fantasy genres, covers many related hobbies and offers a one stop experience for the fans and enthusiasts of those genres. This year GottaCon 2011 takes place on February 4 to 6, 2011 with the convention doors open at 5:00pm Friday and they do not close until 7:00pm Sunday. That is 50 hrs of non-stop gaming. GottaCon will have all you need to make the experience great: contests, tournaments, vendors, demonstrations, and all types of games. 2009. GottaCon intends to deliver another successful year and is projecting attendance levels to be between 1200 and 1500. For more information visit www.gottacon.com. I will also be posting more exciting information about GottaCon in this thread, so check back now and then. Today we announce that we have finished updating our website from Flash to a WordPress format. The new site looks very much the same but can now be viewed with smart phones and devices. The site also loads faster and includes the ability for the public to comment/discuss announcements we make. If you have questions, comments or suggestions regarding our site please respond by visiting our website and commenting under the "New Website for GottaCon" post. We will continue to improve our site over the months and years to come. We will also be making numerous announcements over the next few weeks around sponsors, events and developments so please keep an eye on our website, facebook group andtwitter account to stay up to date. 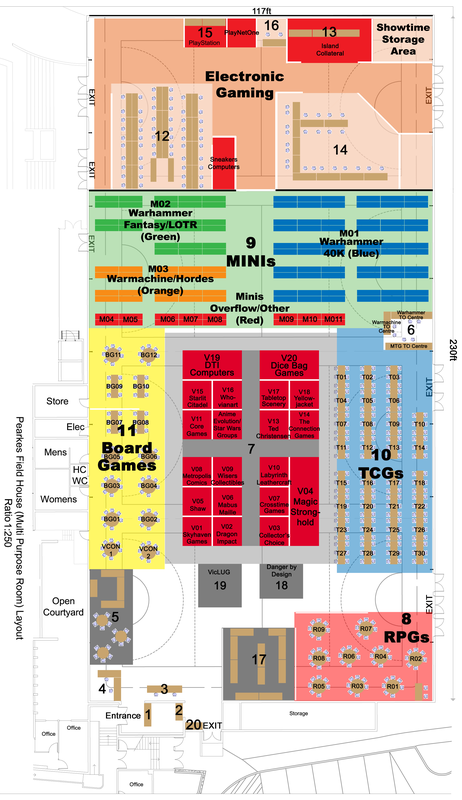 This announcement is a quick update on the status of our vendor booth availability, sponsorship/advertising options and a first look at our preliminary floor plan for GottaCon 2011. We have expanded our TCG and board game areas to keep up with demand. Warhammer 40K, Fantasy and LoTR championship qualifiers are back and bigger than ever!! We have upped our capacity significantly and as such the prize pool has as well. Warmachine/Hordes will make a début at GottaCon 2011 in a big way with sponsorship by Privateer Press. Video games were a huge hit last year and in response to that we have dedicated a lot of effort this year into improving it. This year the Xbox 360 LAN will be back and hosted by Evo Games who will facilitate lots of great tournaments and freeplay. We have expanded our computer LAN capacity and will host a few dedicated servers this year as well. As always attendees are encouraged to bring their own systems and jack into our our LAN at no extra cost. Tournaments and freeplay will be in full swing. Discussions with Play n Trade and the PlayStation events crew are underway in an effort to bring you even more exciting attractions. GottaCon Vendor booths are now over 50% sold out. If you are interested in promoting your business and the many fine items you have for sale at our 2011 show please contact us before it is too late!! Also if you know of a business you would like to see at GottaCon 2011 please let us know and we will contact them. Below please find a link to our vendor information package. Are you thinking of ways to market your business/product to the gaming world? Well becoming a sponsor of GottaCon 2011 is a great way to do just that. Our sponsorship/advertising packages are very affordable and reach the audience you desire. For more information please see our sponsorship and advertising information package. As always please visit our website for more information on our 2011 event! See you on February 4, 2011. GottaCon is happy to be teaming up with Anime Evolution again this year and we will be attending their hugely successful convention this coming weekend (August 13th to 15th, 2010). GottaCon will host a booth in the exhibitor area and be schmoozing it up with all the fantastic attendees and guests of Anime Evolution 2010 (http://www.animeevolution.com/). Anime Evolution is Vancouver&#8217;s premier event celebrating Japanese animation, manga, gaming, and every kind of related fandom. Their featured activities include interactive panel discussions with industry guests, cultural demonstrations, 24-hour video rooms, cosplay contests, an AMV contest, a charity auction, evening dances, and creative workshops. They also offer LAN, tabletop, LARP, and console gaming rooms. Anime Evolution will also be returning to GottaCon 2011 and hosting our costume contest with a variety of categories and prizes to be won. More details on the costume contest will be released in the fall so stay tuned. 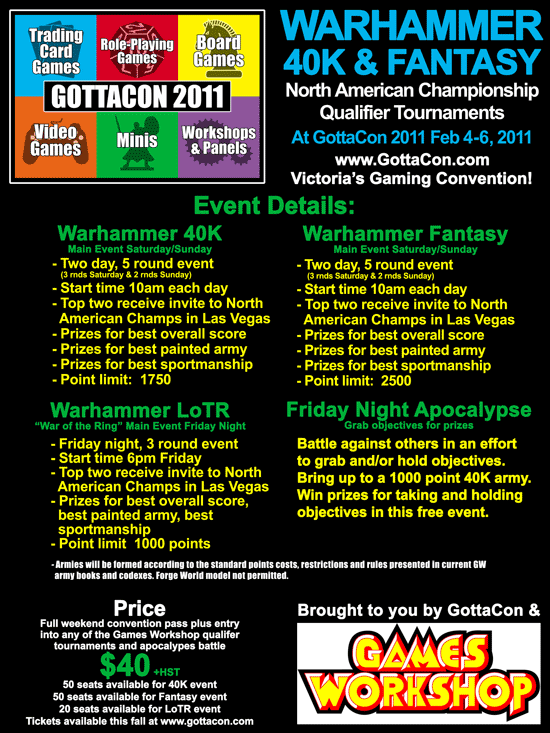 GottaCon is pleased to announce that it will once again be hosting North American qualifier tournaments in Warhammer 40K, Warhammer Fantasy and new this year Warhammer Lord of the Rings at GottaCon 2011 on February 4 to 6, 2011. Come take part in an even larger Warhammer event then last year. The prizes will be even better than last year! Please see below for event details. On opening night, Friday February 4 come out and take part in a free 40K Apocalypse event where you will have the chance to battle against others in an effort to grab and/or hold objectives and win prizes. This event is a great way to warm up for the major Warhammer events that will begin on Saturday February 5 and continue into Sunday February 6. New this year on Friday night we are hosting a Lord of the Rings &#8220;War of the Ring&#8221; qualifier tournament which will start at 6pm and last three rounds. There will be a seating limit of 20 players and the top two will receive invitations to the NA Championships held in Las Vegas as well as additional prizes plus prizes to best painted army and best sportsmanship. Army point limit is 1000. Or just show up and battle against a friend on one of our tables to sharpen your skills for the fun that begins on Saturday. Starting Saturday morning at 10am our two feature Warhammer events begin. A two day Warhammer 40K event will run both Saturday and Sunday starting at 10am each day. Day one will see three rounds of play and day two will see the final two rounds of play. Army point limit is 1750 (no Forge World models). Prizes will be awarded in the following categories; first, second, third and fourth overall score, best painted army and best sportsmanship. Also the top two players will receive invitations to the NA Championships held in Las Vegas. Armies will be formed according to the standard points costs, restrictions and rules presented in current Games Workshop army books and codexes. Seating limit of 50 players and last year we sold out before the end of January. Tickets will go on sale in October and will be sold on a first come first served basis. Also starting Saturday morning at 10am a two day Warhammer Fantasy event will run both Saturday and Sunday. Day one will see 3 rounds of play and day two will see the final 2 rounds of play. Army point limit is 2500. Prizes will be awarded in the following categories; first, second, third and fourth overall score, best painted army and best sportsmanship. Also the top two players will receive invitations to the NA Championships held in Las Vegas. Armies will be formed according to the standard points costs, restrictions and rules presented in current Games Workshop army books and codexes. Seating limit of 50 players, Tickets will go on sale in October and will be sold on a first come first served basis. The price to gain access to GottaCon all weekend long and enter into any of our feature Warhammer events is only $40 +HST. Stay tuned to our website as we will announce when tickets for GottaCon go on sale and where you can get them. If you have any questions please send them to ehatch@gottacon.com. Thank you. 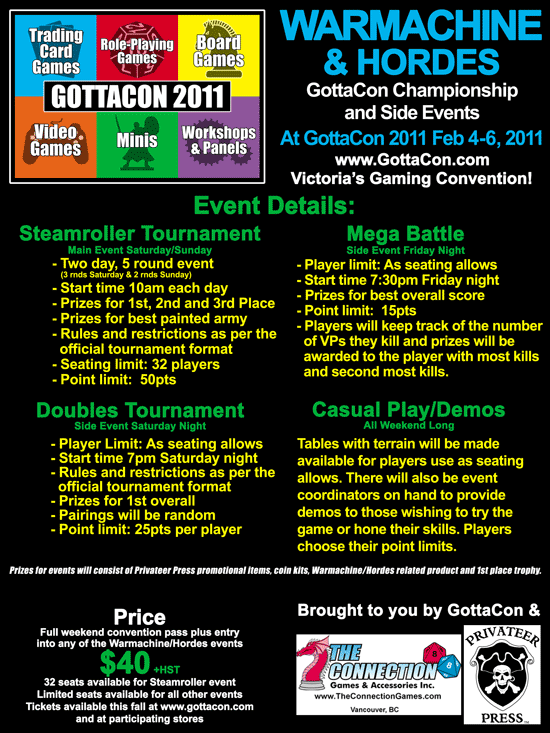 GottaCon is pleased to announce that it will be hosting Warmachine/Hordes tournaments at GottaCon 2011 on February 4 to 6, 2011. Come take part in what will surely be the largest Warmachine/Hordes event ever to have been run on Vancouver Island. Please see below for event details. Starting Friday Evening at 6pm our feature Steamroller Warmachine/Hordes GottaCon Championship tournament begins. A two day Warmachine/Hordes Steamroller tournament will run both Friday night and Saturday night starting at 6pm each day. Day one will see three rounds of play and day two will see the final two rounds of play. Army point limit is 50. Prizes will be awarded in the following categories; first, second, and third overall score as well as best painted army. Rules and restrictions as per the official Steamroller tournament format. There is a seating limit of 32 players. Tickets will go on sale in October and will be sold on a first come first served basis. Starting Saturday afternoon at 2pm our Mega Battle event begins. Players will keep track of the number of VPs they kill and prizes will be awarded to the player with most kills and second most kills. The player limit is as seating is available and the point limit is 15. Sunday morning will see a doubles tournament starting at 10am. Teams of two will face off against other teams battling it out for first overall in this three round event. Rules and restrictions as per the official doubles tournament format. The player limit is as seating is available and the point limit is 25 per team member. Prizes for events will consist of Privateer Press promotional items, coin kits, Warmachine/Hordes related product and a first place trophy for the Steamroller tournament. These events are being brought to you by GottaCon Conventions, Connection Games and Privateer Press. The price to gain access to GottaCon all weekend long and enter into any of our Warmachine/Hordes events is only $40 +HST. Stay tuned to our website as we will announce when tickets for GottaCon go on sale and where you can get them. If you have any questions please send them to ehatch@gottacon.com. Thank you. GottaCon is pleased to announce that it will be hosting a Miniature painting contest, which is brought to you by Dice Bag Games, at this year's convention. If you are a fan of painting miniatures then this free event should interest you. Dice Bag Games has generously offered to hold this event and provide a variety of prizes for it. Entry forms will be available at the Dice Bag Games booth during GottaCon 2011 (February 4th to 6th, 2011). If you have any questions regarding this event please speak to Colin Wheelock of Dice Bag Games by phone at 250-597-1992 or visit their facebook (http://www.facebook.com/pages/Duncan-BC/Dice-Bag-Games/26026 2627630) page and post your questions there. GottaCon would like to thank Dice Bag Games for adding another great event to our exciting lineup. See you at GottaCon 2011! It is with great pleasure that we announce that Yellowjacket Comics and Toys, represented by Nelson Salahub, along with a team of certified DCI judges will be running our Magic: The Gathering events at GottaCon 2011. The judges lined up to assist Yellowjacket this year include Level two judge Max Knowlan, level two judge Niko Skartvedt and level one judge Alasdair Howie. Nelson and the team are sure to deliver an exciting line up of events and prizes. What does this mean? It means all major events, such as the Mirrodin Besieged launch parties as well as the Vancouver Island Magic Community (VIMC) M:TG Open will be run at a rules enforcement level of competitive. Also we will have numerous Mirrodin Besieged launch parties and related events with promos. Nelson and the team will bring experience, professionalism and a reputation which are sure to attract an excellent turnout for these events. Below find a brief list of the Magic: The Gathering events you will find at GottaCon 2011. There will be thousands of dollars in prizes to be won in our MTG line-up. If you would like to see more in depth information on these events please see our full Magic announcement. Due to an overwhelming show of interest in our Warmachine events lineup and lots of great feedback from the players that love this game a major scheduling change is being made to these events. Issues that prevented ideal scheduling of these events in the past were strictly floor space and table space but we have taken steps to find the room and bring in extra tables so the main event can take place during the day on Saturday and Sunday with side events Friday and Saturday night. Please see below for our new Warmachine event details. Starting Saturday morning at 10am our feature Steamroller Warmachine/Hordes GottaCon Championship tournament begins. A two day Warmachine/Hordes Steamroller tournament will run both Saturday and Sunday starting at 10am each day. Day one will see three rounds of play and day two will see the final two rounds of play. Army point limit is 50. Prizes will be awarded in the following categories; first, second, and third overall score as well as best painted army. Rules and restrictions as per the official Steamroller tournament format. There is a seating limit of 32 players. Tickets will go on sale in October and will be sold on a first come first served basis. Starting Friday night at 7:30pm our Mega Battle event begins. Players will keep track of the number of VPs they kill and prizes will be awarded to the player with most kills and second most kills. The player limit is as seating is available and the point limit is 15. Saturday night will see a doubles tournament starting at 7pm. Teams of two will face off against other teams battling it out for first overall in this three round event. Rules and restrictions as per the official doubles tournament format. The player limit is as seating is available and the point limit is 25 per team member. Whether you're a beginner or a veteran, you're welcome to strut your stuff at the GottaCon Costume Contest, sponsored by Anime Evolution (www.animeevolution.com) and Dragon Impact (www.dragonimpact.com). Compete with others to win a prize in one of several categories. Judging will be based on individual costumes. Skits will not be performed (sorry). On Saturday February 5th, from noon to 5pm, convention attendees can stop by the Anime Evolution booth and fill out a contest entry form. At that time their photo will be taken and each contestant will be assigned an entry number. Contestants will be eligible for all categories in their age group. Judge deliberation will begin at 6pm (contestants do not need to be present). The winners will be announced at 6:45pm at the Anime Evolution booth. Prizes will be handed out following the announcements also at the Anime Evolution booth. Entry into this contest constitutes an agreement by the contestants to allow their photo to be taken by the contest organizers. Your photo may be used by GottaCon Conventions and Anime Evolution for promotional purposes at their discretion. This will be the second annual GottaCon costume contest and we are very excited to host this annual event with the help of Anime Evolution!! For rules and categories please visit our website. GottaCon tickets will be available for purchase from our www.gottacon.com website as well as at numerous retail locations (see link below) starting Wednesday October 27, 2010. There are different prices for each day as well as a full weekend pass price, family package prices, special packages which include entry into some of the major events as well as the option to add on a GottaCon 2011 t-shirt and dice set (more on this later). There are a number of reasons why you should get your tickets in advance of the big show. - If you purchase your ticket in advance you receive a 25% discount on your full weekend cost (you pay $30 instead of $40). - Once you have purchased a ticket and our warhorn site goes live in late November you will be able to sign up to our http://warhorn.net/gottacon-2011 site where, once we approve your account, you can start to preregister for events in advance. You will also be able to change your events at anytime up until preregistration is closed. Preregistration helps to ensure your seat at the events you want as seating at most events is limited. It also avoids you having to stand in the event registration lines the days of the convention to sign up for the events you want. - Pre-paying for your ticket also gets you past the lines at the door as we will have an advance tickets line especially for you. Once you arrive just look for this line to get your convention pass, swag bag, program and get directly into the action of the vendors and events. Entry to the Warhammer Lord of the Rings North American Championships Qualifier is complementary with purchase of the Warhammer 40K or Fantasy tournament package. Otherwise it is $40. If you plan to take advantage of the complementary offer you must let us know at the time of ticket purchase either by email, at the store you buy your ticket from or by a note on your paypal purchase. *These prices include entry to GottaCon 2011 the "Event". Some designated activities require preregistration and/or payment of a separate, additional fee. More information on this will be contained in the event listing which can be found at http://warhorn.net/gottacon-2011. For how and where to get tickets, and information on the GottaCon T-shirt and dice package please visit our website. The Howard Johnson Hotel Victoria is located at 310 Gorge Road East along the Galloping Goose Trail and across from the Gorge Waterway, only minutes from the GottaCon 2011 convention, Victoria&#8217;s Inner Harbour, major attractions, shopping, dining and sports arena. Howard Johnson Hotel Victoria offers and comfortable rooms with attentive staff. The Howard Johnson Hotel Victoria is the winner of the Howard Johnson franchise GOLD AWARD for service and quality from 2006 - 2010. They take pride in their hotel, their services and provide excellent service to all their guests. To contact the Howard Johnson Victoria to book your room call 250-382-2151 or 1-800-952-2151. Remember to mention you are attending the GottaCon convention and quote the reservation code CGOTTA to benefit from our special room rates. Once again, we are pleased to have Howard Johnson Hotel Victoria sponsoring our convention on the weekend of February 4th to 6th, 2011. Tickets for our miniature tournaments are selling well. WarHammer 40K is 40% sold out and Warmachine is 25% sold out. So if you want to play in these tournaments please buy our tickets soon! If you have any questions regarding either the WarHammer 40K or Fantasy tournaments please contact ppuhallo@gottacon.com. Our vendor booths are also selling well. We have sold more than 85% of our booths. If you are interested in getting a booth this year please contact ehatch@gottacon.com. 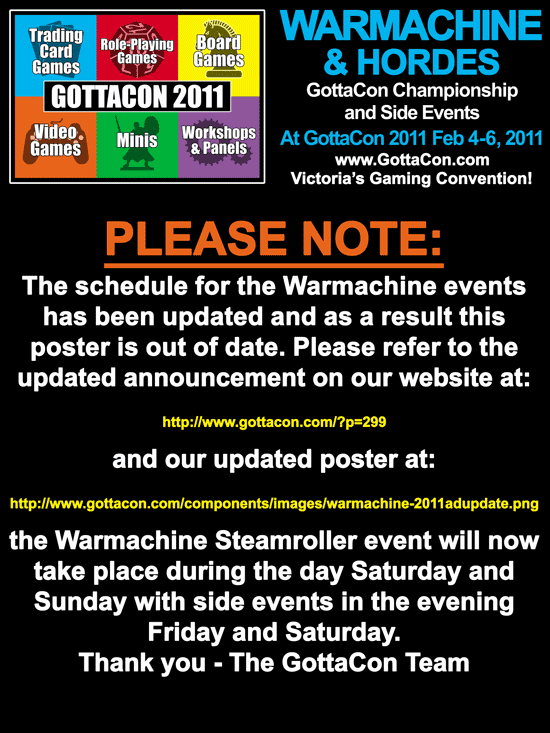 The event listing is now available on our website in Excel and PDF format as well as on our warhorn site located at www.warhorn.net/gottacon-2011. Please keep in mind that the event listing will have events added to it over the weeks to come and we will provide updates on what was added on the sites listed above. In order to pre-register for events you must first purchase an advance ticket to our convention. To do this please visit our website at www.gottacon.com or see the Pricing and Payment section of our Warhorn site or visit one of the seven retail locations selling our tickets (details on websites mentioned). 4) Wait for GottaCon Staff to clear you (remember only people who have purchased tickets can pre register for events). You will receive an email letting you know you have been cleared. If you are organizing an event or are a vendor at our show please let us know which event or which vendor and we will clear your account. We are putting out the call for event submissions for GottaCon 2011. If you would like to run an event at GottaCon 2011 (become an event coordinator) please contact Evan Hatch at ehatch@gottacon.com letting him know. He will send you an email containing information on what to do next. Benefits for event coordinators will be the same as last year which was get $10 off the $30 entry fee for each slot of events you run. Run three or more get in free. If you are attending for the full weekend you will also receive a swag bag and be granted early access to the convention Friday if you show up between 4:00pm and 5:00pm. This is in an effort to get you in before the rush which will allow you time to check out the vendors and the rest of the convention. This year we will continue to award draw tickets to those people that participate in events labeled as a demonstration in an effort to get people trying out a variety of games. These draws will happen at the end of each slot (from 9am to 11pm each day) on top of the door prize draws and other giveaways. Thank you and if you have further questions please contact Evan Hatch at ehatch@gottacon.com. On Saturday February 5th only between 9:00am and 6:30pm, come out and take part in the GottaCon gamers silent auction brought to you by GottaCon Conventions. Convention goers are welcome to bring out their own items for sale as well as bid on the wide variety of items that will be available. We stress patience with convention staff as it takes time to enter all the information of submitted items and when the auction is complete to record all the results. In this type of auction, items are put on display. To place a bid, bidders write on a piece of paper located near the item. The bidder will be able to see the bids made already and must bid at least the minimum amount specified higher than the current bid. The minimum increase over the current bid will be $1.00 unless otherwise indicated. Bidding closes after a pre-set period of time. The highest bidder at the end of the auction wins the item and pays the price submitted. The GottaCon silent auction will run from 9:00am until 6:30pm. At 6:30pm all bidding will stop. Winners may pay for the items they won starting at 7:30pm. If you cannot be present at 7:30pm winners may purchase their item any time between 8:00pm and 9:00pm. If you cannot pick up your items by 9:00pm Saturday night and you have not made arrangements with the GottaCon Conventions staff for an alternate time the item in question will then go to the next highest bidder. Please be patient with our staff at the end of the auction as they have to collect the items and record the winning bids before they can be released to the winners. Cash is the only form of payment accepted. During the auction all items will be monitored. GottaCon Conventions is not responsible for lost, stolen or damaged items. Please bring your item to the GottaCon auction booth in area 16 on the map and be prepared to fill out a quick info sheet on your item. This info sheet will help others identify and understand your sale items as well as allow us to keep track of whose item is whose. All items will be put on display with a bid sheet. We recommend assigning a minimum bid to each item you submit. There is a small non-refundable charge of $1.00 (HST included) for each item submitted for sale. Items for sale may be submitted at the GottaCon auction Booth between 9:00am and 5:30pm Saturday February 5th. Please check in with the GottaCon auction booth between 7:30pm and 9:00pm Saturday evening to find out if your item(s) sold or not. If your item sold you will be reimbursed the amount it sold for once payment is received. If you are not able to be present during the time indicated above please make arrangements with the GottaCon staff. Please be patient with our staff at the end of the auction as they have to collect the items, cash and record the winning bids before they can pay the owners for their items that sold. If your item does not sell your item will be returned to you. Please check in with the GottaCon auction booth between 7:30pm and 9:00pm to find out if your item sold or not. Any items that do not sell and are not collected by 7:00pm Sunday February 6th will become the property of GottaCon Conventions. If you are not able to collect your items during the time indicated above please make arrangements with the GottaCon staff. The GottaCon auction provides a great opportunity to buy and sell all of your gaming and hobby related items at great prices. The previous two years have been hugely successful so make sure you check out the auction on Saturday!! Please note that GottaCon Conventions reserves the right to refuse any items submitted for sale in the auction. All items must be registered with GottaCon staff at the special events area and a fee of $1.00 per item must be paid. There are more than 55 RPG events! WOW that is a lot of events!!!! GottaCon would like to thank all the event coordinators for making these events possible and a special thanks to the crew at the Vancouver Island Gaming Guild for their efforts to bring out a huge team of GMs and modules. For complete details on the above events including descriptions please download our event listing here http://www.gottacon.com/components/gottaconeventlisting.pdf or view the events on the Warhorn site here http://www.warhorn.net/gottacon-2011/schedule/day.php. We hope you find a few games above to your liking and will come out to GottaCon 2011! Prizes announced for GottaCon 2011 VIMC MTG Open Tournament. Prizes are laid out by the two qualifiers as well as the finals. There will be additional prizes awarded the the top four in the finals as indicated. These will be made up of either futureshop gift cards or other great prizes. This is our biggest prize pool yet. This prize pool is based on an estimated 80 players. if we get more prizes will increase. GottaCon would like to thank all the event coordinators for making these events possible and a special thanks to the VCON, Skyhaven Games and Interactivity Games and Stuff crews for their efforts to bring out a huge team of board game masters. For complete details on the above events including descriptions please download our event listing here http://www.gottacon.com/components/gottaconeventlisting.pdf or view the events on the Warhorn site here http://www.warhorn.net/gottacon-2011/schedule/day.php. If you plan on attending GottaCon 2011 and the massively huge and impressive amount of games available this year you should buy your ticket while they are still on sale and save yourself some cash. Full weekend tickets can now be bought for $30, but after January 24th you will have to buy your ticket at the door and it will cost you $40. Buying your ticket now also lets you sign up in advance for any events that you really want to get into on our Warhorn site. It just makes sense to buy them now. There are multiple ways to get tickets! 1) Paypal &#8211; Pay from the comfort of your own home via our website. 2) Purchase a ticket at a local participating retail location &#8211; Listed below. It is very important to remember that when you purchase your ticket that you include your first and last name and the full name of the individual(s) that the ticket(s) are for as well as a phone number and/or email address we can contact you at to confirm your purchase was received. Once you have purchased your ticket we will update our records, then all you have to do is sign up for events and show up on February 4th to 6th and enjoy the show. If you don't get your tickets in time, don't worry tickets will be available at the door. Event preregistration via Warhorn will remain open for those that pre-purchased tickets until January 31, 2011. Thank you and see you at GottaCon!! GottaCon 2011 is only three days away, starting at 5pm on February 4th, 2011 which will bring 50 straight hours of non-stop gaming goodness. Whether you like video games, trading card games, role playing games, miniatures, or board games we will have something for you. GottaCon also features a variety of exhibitors, face painting, full body painting demonstrations, a Lego kids build for the young and old, a costume contest as well as our ever popular silent gamer's auction. GottaCon is also happy to have added a board game library this year that includes games from; Fantasy Flight, Days of Wonder, Rio Grande, Steve Jackson Games, Mayfair Games, AEG, Zman Games and others. We are also pleased to release a link to our web version (PDF, 7MB) of the GottaCon 2011 Program. We hope you enjoy it!! All the ads are linked to their respective sites where possible. We are expecting a great turn out this year. If you are part of the line-up on Friday to get through the doors please be patient as we work as hard as we can to get you in as fast as possible. GottaCon 2011 saw over 20% growth from last year, with more than 1100 people coming through the doors. There were more vendors and sponsors, which meant more prizes and giveaways. That said, GottaCon 2012 is now on the radar and planning will commence shortly!! GC 2012 dates are February 3 to 5, 2012. GottaCon would like to thank all the fantastic volunteers and event coordinators who came out and made the event great. Also thanks too Paul Puhallo, EVO Games, Lower MainLAN, Rida Vanderkam, Starlit Citadel, Anime Evolution, IRL Events, VicLUG, VIGG and Interactivity Games for coming out and organizing some great tournaments. Check out photos from the event on our Facebook group. Add your own and tag your friends. Look for more information on GottaCon 2012, Feb 3 to 5, soon!